Each month we choose one book that you absolutely should not miss. 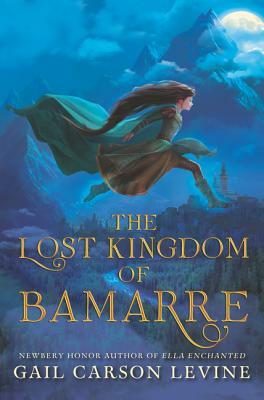 This month we chose Lost Kingdom of Bamarre by Gail Carson Levine, on our shelves today! Our bookseller Natasha’s review is below. We hope you’ll check it out! Gail Carson Levine is the queen of fairy tale retellings. She has already conquered Cinderella, Snow White, and countless other fairy tales throughout her career. She popularized fairy tale retellings in children’s chapter books and won a Newbery for her novel Ella Enchanted in 1998. In her latest book, Levine has once again created a clever, engaging story with The Lost Kingdom of Bamarre. For those who are familiar with Levine’s previous works, you may recognize the story as a prequel to 2001’s The Two Princesses of Bamarre. However, you don’t need to have read The Two Princesses of Bamarre to enjoy the prequel. Peregrine (Perry) was born and raised a Latki, a proud warrior-centric people who have fled their terrifying monster-riddled land to live with the weaker Bamarre, who Perry knows as the Latki’s farmers and servants. Striving to live up to the ideals of her parents, the stern but loving Lady Klausine and Lord Tove, who despises only the Bamarre, Perry has wanted nothing her entire life but to join her father on the front lines. Then, just as all her dreams seem destined to come true, a fairy reveals a shocking secret: Perry is Bamarre! As she struggles with the truth and confronts her ingrained prejudices, Perry decides she must find a way to free them from the tyranny of the Latki. And once Lord Tove learns her secret, she realizes that she must flee if she wants to live long enough to save her people. Luckily, this is a fairy tale at heart, so with the help of an enchanted seashell, a pair of seven league boots, a very helpful tablecloth, and a little bit of fairy magic, Perry sets out to do just that. Of course, even in a fairy tale, magic can’t solve everything, and when Perry finds her real family, she discovers she has much to learn about the Bamarre and their culture before earning their respect and taking her place among them. Once she does, Perry realizes that she cannot complete her mission until she faces her adopted parents and confronts Lord Tove once and for all. Peregrine is comparable to Gail Carson Levine’s beloved heroine Ella from Ella Enchanted in her spunkiness, her drive, and her cleverness. The Lost Kingdom of Bamarre does a beautiful job of taking prejudices similar to those in the media today and placing them in a world where young readers can understand. Perry’s struggle to reconcile with her father’s love for her, despite his deep hatred for the Bamarre, is heartbreaking and resonates strongly, as is Perry’s struggle to redefine her understanding of strength. With impressive nuance, Levine has once again created a spirited, independent, resourceful heroine worthy of admiration from boys and girls alike. Previous Post Announcing the new Trust Fall selection! Next Post New Books 5/2!